Ahhh, children’s birthday parties. The home of sugary highs, tear-streaked lows, spills, jealousies, and opportunities galore to teach manners and etiquette. It seems like these days each party – each family, each home – has a different level of expectation regarding a wide range of issues. What is the appropriate birthday party etiquette for kids? Children’s birthday party etiquette includes questions of when to RSVP, how much to spend on a gift, how long to stay, when to excuse your child’s rude behavior or when to address and correct it. There are no easy answers. It can largely depend on your personal views, the age of your children, local culture, location of the party, and the socio-economic world of the host and guests. But never fear! We have assembled the best tips from a variety of sources to bring you birthday party etiquette for kids that will be appropriate in a wide range of birthday parties. This article is a basic yet comprehensive guide to birthday party etiquette for children. 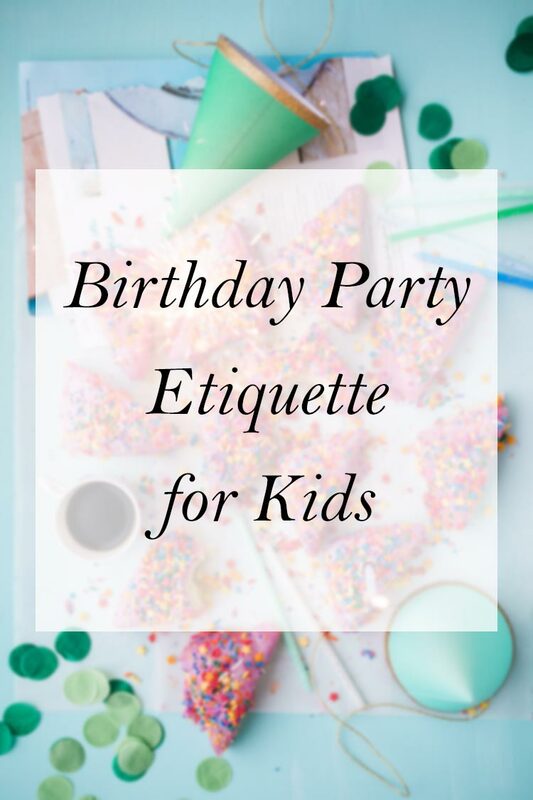 Geared towards teaching kids how to behave at their own party or that of someone else, we will also include tips to help direct parents when hosting or attending a child’s birthday party. Below we have arranged our guide moving from general manners to specific birthday party etiquette. We will start with a list of foundational “basic manners” in which all children should be well-practiced. After that comes the general manners for how a child should behave in another person’s home, followed by manners for when the child has guests in their own home. Lastly, we will address etiquette specific to birthday parties. RSVPs, thank-you notes, gifts, manners, and all the rest. Let’s get started! When people speak to you, respond politely. Most often, people will ask “How are you?” You should tell them how you are, then ask them how they are. Do not interrupt others (unless it is an emergency). Do not engage in foul language, body humor, or name calling. When you walk through a door, see if you can hold it for someone else. Ask permission before touching or doing anything. Do not complain about food, activities, or anything else. Do not comment on the way another person looks, acts, or speaks; unless it is to compliment them. When leaving, thank your friend’s parents for having you over. Knock on closed doors, and wait for a response before entering. Ask to help someone in need. If they say yes, do so. If someone asks you for a favor, do it as best as you are able and with a good attitude. When eating, keep a napkin on your lap, and use it. Do not use a cell phone. Some exceptions may be to call/text your parents, for an emergency, or to briefly take an appropriate photo of an activity or group of friends. If you take a photo, ask anyone in the photo if you can share it before doing so. Put away breakables/collectibles beforehand, so that other kids won’t play with them. When a guest arrives and leaves, thank them for coming. Have drinks ready and offer them to your guests after exchanging greetings. Do not comment on the dinner table habits and manners of others. When invited to a party, read the invitation thoroughly and RSVP promtly. Do not wait until the day before or morning of the event. Add the event to your calender, and get a gift in advance. Do not ask if siblings can come; if the invitation doesn’t say it, assume no. Parents of young children are generally expected to attend. As the children move up in to elementary school, parents are not always expected to stay. Refer to the invitation, ask if you’re unsure. If you are uncomfortable dropping your child off, ask if you can stay when you RSVP. If they say no, you are free to decline the invitation. A reasonable birthday gift can be in the $10-20 range for just about any setting. Avoid cell phone use. This goes for parents and children alike. When you arrive, say hello to the birthday child and their parents, and thank them for inviting you. Do not arrive to a party empty-handed. If an activity or the party itself is boring, keep it to yourself. If you have a cell phone, use it only to contact your parents. Send invitations at least a week in advance, but no more than four weeks. Involve the birthday child in the invitation process. Ask for diet restrictions along with the RSVP, and do your best to comply or provide alternatives for any child with allergies or other dietary needs. Make it explicit if parents and siblings are welcome, and also let parents know if they are not required to stay. Some parents are uncomfortable with dropping their kids off, others appreciate a couple hours of kid-free time. Some parents do not have babysitting alternatives for the siblings and won’t be able to attend if the siblings cannot come. Be prepared for extra guests: Younger siblings, neighbors, others added at the last minute. Make enough food, get extra party favors and utensils. Be gracious when an unexpected guest arrives. Taking photos is expected, but ask the parents for permission if you plan on posting to social media. If they decline, assure them that you understand and respect their decision. Have a first-aid and spill kit ready for when accidents happen. Think about the other kids’ feelings when handing out invitations at school. It is not very polite to talk about the party if the entire class is not being invited. You (and your parents, depending on age) should greet guests at the door and thank them for coming. When guests leave, the you (and your parents, depending on age) should walk them to the door and thank them for coming and for their gift. Send a thank-you note to each person who attended. Thank them for coming and for their gift. A hand-written note is ideal and shows your appreciation to the fullest. SHOULD THE CHILD OPEN GIFTS? That is up to you. Children love to open gifts right away, but there is also the chance of the toys being a distraction or disappointment, with either reaction being rude to the giver and other guests. However, you can counter this by using it as an opportunity to train your child beforehand to behave graciously. Additionally, the guests love to see the joy on a child’s face when receiving their gift. On the other hand, guests (especially young children) can get bored during the present-unwrapping stage. You can avoid the boredom by opening presents later after guests have gone, by giving each child a party favor when their gift has been opened, or by passing gifts around so each child has a chance to look at it. DO I HAVE TO PROVIDE PARTY FAVORS? No, you don’t have to do anything, but it is expected and a lovely gesture to show your appreciation for each child’s attendance. Party favors also provide a small, simple way to respond in kind to thank each child for bringing a gift. And lastly, most children attending a birthday party hope to receive some fun party favors and get very excited about it. Some options for party favors: Most local dollar stores have a large party supply section complete with goody bags and items to fill them, 10-20 filled bags may cost you about $8-15. Find puppy stuffed animals at a dollar or discount store (or go big with the popular Beanie Boos) and do an “adopt a puppy” box by the door. You can also send a simple homemade treat home: Individually wrapped cupcakes, cupcake-in-a-cone, baggies filled with chocolate covered pretzels, a DIY bake-a-cake mix with instructions. For more creative types, you can have a party activity in which the children make their own party favors: Dipped chocolate treats, a custom decorated cookie, this fun make your own crazy sunglasses activity, DIY colorful slime made from a few simple ingredients, decorate t-shirts with markers. Edibles will vary depending on the time of the party. If the birthday party is scheduled during a normal lunchtime, say from 11:00 to 1:00, you should serve lunch items. Hot dogs and hamburgers are easy and popular, as is pizza, sandwiches, and chicken nuggets. Punch, lemonade, and juice are popular beverages; chips and fruit are great side dishes. If adults are staying, feel free to include some more grown-up beverages such as Talking Rain, La Croix, and/or craft beer along with some non-kid oriented sides. When you’re providing lunch, dessert, drinks, and party favors for a big informal crowd, it’s fine to ask adults who are staying to bring a side dish. Be considerate regarding allergies and intolerances. In our family, dairy is off-limits for half of our family members, so grilled fare such as hot dogs, hamburgers, and chicken work well (gluten-free people can go sans-bun). Build-your-own entrees are also a good option: With tacos, nachos, or sandwiches guests can simply leave off the ingredients of their choice. Same goes for dessert. Cake, cupcakes, and ice cream are practically synonymous with birthday parties. For those with intolerances, most supermarkets or specialty markets have dairy-free ice cream and gluten-free options. There are plenty of wonderful resources on manners and etiquette for children. Here are some of the best. These are not limited to birthday party etiquette, but are highly applicable to parties and some even contain chapters on the subject. I love what you said about reading party invitations thoroughly before sending them out. I think finding the right party room can make your child’s birthday party a memorable experience. If I were to throw my son a birthday party, I would surprise him with an amazing party room.